1. Why thieves steal soap. 2. Farmers have stronger hips. 3. Has Singaporean meritocracy gone too far? 4. The most Canadian photo ever? 6. The aging of Cindy Sherman (NYT). 7. Lonnie Mack has passed away; The Wham of that Memphis Man! is one of my favorite albums. I can see some consumer value. There are 44,200 results for "6' hdmi cable" on Amazon. Presumably Amazon has looked at one, found it adequate, and given it a fair price. The interesting part is that Amazon is playing this in both directions: I t can get you a cheap replacement of a premium brand they sell, like in retail, but it also gives you a more trustworthy equivalent of what they often sell through the marketplace. Am I getting the real thing, a stolen item, a knockoff? Amazon comes in guaranteeing both good quality and a cheaper price. The store brand is the cheapest at the store. Amazon's item is smack in the middle. More than a few very low cost items sold on Amazon are shipped directly from China. Presumably prices for these goods are low because North American customers know they'll have to wait longer, but also because there's more perceived risk because the seller is unknown and, being overseas, it may be impossible to obtain a refund. Whereas if Amazon offers the same goods branded as "Amazon Basics" they will be worth significantly more as the shipping time is much less and consumers have some confidence in the Amazon Basics brand as well as in Amazon's return privileges. In short, these goods may not cost much but Amazon should be able to obtain large margins by reselling these goods under its own brand name. re: shipping directly from China. For whatever reason the USPS has a deal that gives preferential rates from China that disadvantages US sellers. Let's cry some crocodile tears for US sellers (of mostly imported goods). What matters is the benefit to consumers. What happens with the nordics? Lack of sunlight? Yes, Vitamin D (along with Vitamin K2) is the most important micronutrient for bone health. Calcium is generally overrated. From a physical activity standpoint, high-intensity resistance training is the best for strong bones. If the entire population did heavy weighted barbell squats once a weak, hip fractures would virtually disappear. Balance can be taken care of by using a Smith machine. But the knee problem remains for sure. Some help can be got by restricting the range of the squat - you don't need to go down to the ground. Also by good technique. But whether or not this actually helps with reducing hip fractures, I am afraid this is one of those things that is almost impossible to show due to the confounding factor that people who squat are almost certainly in better health than those who don't squat for other reasons. Not least of these reasons is conscientiousness. In general on health topics - people are usually much more confident about the benefits than is warranted by the evidence - I wonder why that is? #5 Not just consumables either, Netflix's whole platform is based on AWS. Now that Netflix and Amazon are competitors, one must wonder if this was Amazon's scheme all along. I definitely see trust issues arising between Amazon and vendors/clients, as they will naturally begin to ask if the Amazon platform is a Trojan horse. Except that AWS and Amazon don't talk to one another. At all. If Netflix is the 3rd/4th largest AWS customer, AWS will be bending over backwards to support them and do whatever they want, while Amazon gets more and more annoyed at AWS. Because that annoyance has to go up through the great god Jeff, and then back down through 3 or 4 layers of management before it hits the AWS peons, or even sufficiently low-level managers that there can start being concrete anti-Netflix action. Not saying it can't happen, but it'd be hard. /Of course, "Please hand us their bills so we can see what services they're using, and maybe ask for features based on our roadmap" will happen, but they won't screw with Netflix, they'll just replicate their business model. Charming - I bet you think Bezos has no input at the Washington Post, either. #1 the article was posted a week ago, but many comments are 2 years old, or 7 months old - recycling markets in everything? A some point, all possible listicles will have been written, and will be maintained by wiki. The article doesn't mention the contribution of vitamin D to reducing incidence of hip fracture. Farmers spend more time outdoors, hence more sunlight exposure. Sunlight increases natural vitamin D, which is synthesized in the skin by exposure of cholesterol to UV light. This is especially important at high latitudes like Sweden, where the data came from. Instead, the article suggests it is the physical activity of farm labor that causes the effect. Walking would certainly correlate with vitamin D as well. 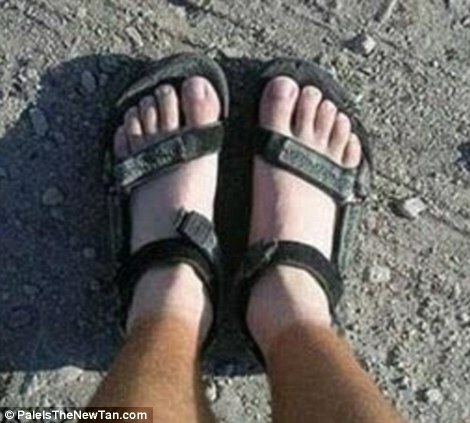 I have my hiking sock tan lines going for the summer ... pretty much me, IRL. Could be both. Vitamin D helps with Calcium absorption and bone health , but so does weight bearing exercise like walking and lifting. Combine sunlight, calcium rich foods, and weight bearing exercise, and you've got a magic formula for born strength. The Singapore story is messed up. WP somehow equates elitism and meritocracy. Elitism is what I see as a derogatory expression describing leadership because of social class membership, whereas the Singapore system is opposite. Does WP think Singapore needs more useless people in government, so they can make more problems like Flint water, and Colorado mine spill orchestrated by epa? "University tuition fees in the United States has been escalating at an alarming level, creating a barrier to education for less-wealthy students and loading those who do manage to pay the fees with debt for several years after they graduate. But strong government oversight in Singapore, by comparison, has kept education fees very affordable. An education at elite schools and the national universities is never priced out of reach of the average Singaporean household, with grants made readily available to students who are unable to bear the full costs of their education. Affordability is thus never a major barrier for students who merit entry into Singapore’s best educational institutions. Meanwhile, the government gives assurance that every school is (at least) a good school." Note "strong government oversight in Singapore, by comparison" ..
Perhaps we fear the wrong things, and leave $100 bills on the pavement. No US universities accept purely on merit and they buy money and political influence through legacy admits, affirmative action, and the pursuit of large donors. They blather a lot about overly narrow measures of merit while not suggesting any reasonable and workable alternatives. The Ivy League solution is to entrench as "compassionate" an arbitrary, unmeritocratic, but very elitist admission system, with just enough tokens to hide the fact that things done by the rich to get into US elites would be considered pure corruption if we read about it in China or Russia. And of course, unlike the Ivies, there is less grade inflation in Singapore. And grades in the humanities can be as meaningful as grades in the sciences, tending to level a little bit the academic playing field between different disciplines. There's so much financial aid in the U.S., though. I think households with an income of <$100,000 go to Harvard for free? That's representative of the scope of the aid. "This Toyota costs fifteen million dollars, but if you hand over the financial records of yourself and everyone in your immediate family [so I can figure out how much juice I can actually squeeze out of you], I'll probably be willing to make you a free cash grant towards the purchase price of up to 90%! What a deal!" How is that hypothetical Toyota purchase different from the status quo? Do you pay cash for all your vehicles and never allow the dealer to pull a credit report? A credit report, which basically only states whether you have a history of paying your bills, is much less invasive than the audit required by "financial aid". Also, I wasn't joking about the family member thing either. You can co-sign a car loan, which will bring the co-signer's credit into consideration, but college financial aid departments typically require you to submit your family's financial records by default. Tuition at elite colleges is like airfare: nobody pays the same amount. That seems odd to me, that the kid sitting next to your kid in class doesn't pay the same tuition. I (sort of) understand the airline model, but I don't get the college model at all. What if the college model were adopted for apartment rent, for groceries, for clothing, for everything. Doesn't anybody care about transparency any more. The quality of apples or clothing doesn't increase if the price is tailored in a way to ensure that the people I stand in line with are of maximum apply-buying quality. Harvard has a strong interest to ensure that non-wealthy but highly motivated/competent people can enter into the program. It increases the value of the education. I think the quality of the competition and networking in a university is very important for the value of the education. I am thinking more that "strong government oversight" of state colleges would mean someone goes in and tears out the climbing walls. I quote enjoyed the option of climbing walls. It might even have made me a better student, or at least, more well-rounded and fit. The premise is that meritocracy eventually simply begets an entrenched elite. Singapore has been Singapore for 50 years. The first generation builds the house. The second knows how the house was built. Singapore now has two universities in the top 13 of the QS world rankings. My two eldest kids attend(ed) a very average neighbourhood school here and many of the students go on to attend the very best secondaries and universities. In fact it's been an interesting phenomenon that the top primary school students are increasingly coming from these schools, partly because of very high achieving kids from India and China. A lot of the success is due to the maintenance of stable and supportive family structures here. There's little any government or society can do once families start failing their children. What is happening in Singapore is interesting. Lee Kwan-yew was not a big fan of the Welfare State. He pushed for a system of equal opportunities - a very state-centered system of equal opportunities but the idea was to allow the most talented to rise. He strongly opposed welfare dependency. His son seems to be rejecting that because the voters are rejecting it. They want welfare and they are getting it. Baby God is dressing this up in various ways - the Pioneer Generation for instance - but that is what it boils down to. So even though Singaporean outcomes are excellent - it is richer than its former colonial master or the US - the voters want more fairness. That is a huge story. Instead all we are concerned about is broken hips and how this affects college entrance in the US. Come on people. Let's try to be a little less of a cliche! More welfare is not "fairness." Singapore is becoming soft and decadent. The son lacks the virtu of his father. US children of the fifties and sixties grew up in a time of abundance, unlike their parents in the Great Depression. Perhaps Kuan-yew fils is just another baby boomer. #1 is great because there's 1,000 words of this lengthy, pseudointellectual discourse on the Economics Behind It All, then at the very end they ask the Walgreens cashier and he explains it in one sentence. Silly me. I thought the reason was that thieves want to make a clean get away. The article is clickbait because readers know that soap (unlike razor blade cartridges) is relatively large and heavy relative to its value, and task #1 for shoplifters must be to get the loot out of the store. When all products (or at least the ones most attractive to thieves) have RFID tags, shoplifting will become more difficult. Assuming the tags can be embedded in ways that make them difficult to remove, anyway. Singapore is fabulously weird, usually in good ways. The newspaper this week announced planning for a new neighbourhood that will use autonomous 'pod' cars to get people around. And you can't go ten minutes without seeing a new subway station being built. Whenever I leave I always miss the racing-into-the-future feel of the place. You like new tech like trains? Come to Europe or America, we have this 20th-century killer app called actual democracy. 4. Good picture, but there should be a Bible. Guns, girls and God--that's America. Hey, we're putting a gun-lovin, radical Christian on our $20 bill dontchaknow? Dress her in a flag bikini, and we're there! I recall hearing this explained some time ago as the reason truck hijackers prefer trucks loaded with mundane stuff like cigarettes. It may even have been on some fictional crime TV show. My trucker uncle said that cigs were the truck cargo most commonly stolen by drivers of long-haul trucks, because they are easily fenced, have a high value per unit weight, and are relatively non-perishable. You'll always have an "elite". The trick is keeping the elite from becoming generationally entrenched. Various forms of academic meritocracy can work for awhile, until the existing elite figures out how to make sure their kids have advantages over non-elite kids (tutoring, access to good schools, admissions coaches, etc). Once this happens on a large scale, meritocracy is effectively subverted. An elite is one way to view social organisation, much favoured by Marxist thinkers. Another, more pertinent way in cases like the American South is whether one group of people not primarily identified with levels of economic activity, and not necessarily a minority of the society, enjoys supremacy over another group of people. Singapore happens to fall in both 1 and 2. Of course, if you talk mainly to Singaporean civil servants, you will probably get a good-guy story about the Singaporean elite. School admissions are based on more relevant tests than the IQ test. Doesn't it depend on what you think the purpose of school is? If it is to develop intellectual skills and retain academic knowledge, IQ test results are very important. Well, clearly you're in strong disagreement with the folks I regularly debate with about education being related to IQ scores. IQ tests are ridiculously too narrow to give meaningful information about either the academic ability of a student or whatever knowledge they have accumulated in previous studies. "If we have to have an elite"...why do we have to have an elite? Also only a sad person would think that being a bureaucrat in Singapore is being part of the "elite". Singapore GDP is about the same as Atlanta - around $300bn pa. Would you consider being a mid-level manager in the Atlanta city administration part of the elite? I would even bet that the Atlanta manager has a better standard of living in terms of size of house, car etc. I like Singapore a lot - it is a very nice orderly place in a part of the world where developed cities like this are rare. But it is only by accident that Singapore is not part of Malaysia, and Malaysia is only by accident not part of Indonesia (they speak the same language and share the biggest island). If we look at Singapore as the New York of that region, it is not so special. #1) It's amazing how rational people are when rationalization of government intervention doesn't require them to be irrational. I am confused as to how thieves know what to steal without government at least nudging them in the right direction. After all, according to some, people need government to tell them what buildings to build, what foods to eat, what health insurance to buy, and how to save for retirement.